In 2001 Trevor Baylis tested a phone-charging shoe on a 100-mile walk through the Namib Desert – yet the idea never took off. Now a similar invention has caused a stir in Kenya and even caught the attention of Eric Schmidt. Kathryn Cave visits Baylis’ house in Eel Pie Island to learn more about being a stunt artist, how he’s become famous for solving African problems… and the thorny issue of patenting. The rain is pelting down in heavy sheets as I make my way over the foot bridge onto Eel Pie Island. 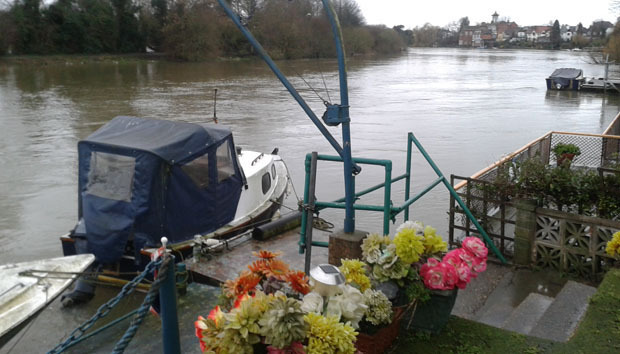 Underneath, the Thames is extremely high and flowing at a ferocious pace. It has burst its banks not far up river and people are being evacuated from their homes. This island is tiny, does not allow cars, and maverick British inventor Trevor Baylis has lived overlooking the river since he built his house using a wedge of cash made from being a stunt artist, back in the 1970s. “Did you not think about making it self-sufficient when you built it?” I ask. “Well, I did think about it,” he said. “But I was more concerned about keeping the water out.” Baylis used the earth extracted from digging his swimming pool to ensure the house remained flood proof; a most sensible idea under the circumstances. Trevor Baylis is all about practical solutions to make things better for real people. 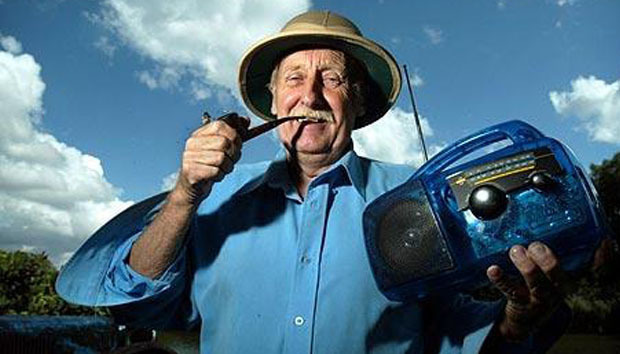 He is most famous for developing the wind-up radio in response to a TV program about lack of communication surrounding HIV in Africa the 1990s. 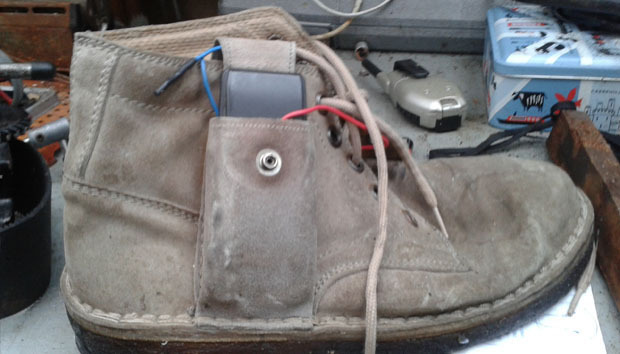 This earned him a place in the Guinness Book of Records along with a record for the first phone charging shoe, which he trialled on a TV trek across the desert in 2001. “New technology is brilliant, I’m not going to knock it,” explains Baylis. “[But] most children wouldn’t know how to put a screw in a bit of wood. We have to get kids more hands on. They could teach it in schools. When I was a child I could do the most amazing things with my Meccano set and yet I couldn’t write my name.” Baylis built his first petrol engine by the time he was 10 with the help of his engineer father and has a firm belief in simple solutions. Baylis has had an extremely varied career which has included swimming for Great Britain and working as stunt man in a Berlin Circus. In an escape act called Ramesses II (which his autobiography, ‘Clock This’, wryly describes as: “I must have been the only blonde pharaoh with a cockney accent in the rich, meandering history of the Nile”), he was dropped into a swimming pool in a sarcophagus… and his trick was to burst out of the coffin to the rapture of the crowd. This led to the development of a suite of 250 products to help the disabled called Orange Aids which he produced through the 1980s. The aim of these simple gripping devices was help the non-able bodied perform simple tasks, like open a jar of jam. However, like so many of his ideas they never got anywhere. The thing that did take off and made his name was the wind up radio. Yet once this went into production it was modified to incorporate a battery - rather than clockwork mechanism he patented - and other people reaped the rewards. But even before this success, the radio was rejected by numerous businesses throughout the UK and was eventually developed as a socially responsible scheme for South Africa. The then named BayGen factory was set up in Cape Town to employ 35% disabled people. Baylis explains: “I think it is important we employ disabled people because they know better than you and me about the problems that should be solved.” It was this employment approach that led to an endorsement from an extremely powerful champion – Nelson Mandela himself. Baylis makes a pertinent connection between difficulties in the developing world and some of the trials faced in wartime Britain (he was born in 1937). “When I was a boy, during the war if someone had a television us kids uses to climb over the garden fence and look in through the window because most people couldn’t afford television.” Instead they made things, using the materials available. Today much of the African continent today is still blighted by a lack of electricity. The continent wide mobile penetration may now be very high, but it is unmatched by the ability to charge these devices. So, in 2001, about a decade ahead of the curve, Baylis undertook a 100-mile walk through the Namib Desert, in which he tested a shoe phone charger. “The crazy thing is nobody was interested in it,” he continues. “Why do you think that was?” I say “Ask me another…” he replies. He also wants to see practicality brought to the forefront of education and envisages a qualification system for inventors. This would start with a Bachelor in Invention where you would place your patent number after your name. It would progress to a Masters, obtained after you had started your own enterprise and employed a certain number of people. And it would culminate with a Professorship once you go into production big time.